Our car, a Bentley 4.5 L Le Mans Tourer from 1928, is a similar model to the Le Mans winning car back in 1928. During the past two years the car has been prepared especially for this trip. In 2011 the differential and engine received an overhaul, which included new bearings, piston rods, pistons, valves, valve tilt system, oil pump and clutch. The magneto ignition was looked through and the coils were replaced with new ones. This year the gearbox was renovated. New carburators have been mounted, as there was no possibility to install an air filter on the old SU «sloapers». The wiring has been replaced and all joints have been mounted underneath the dashboard. A modern generator has been fitted. The suspension has been taken apart, bolts and nuts renewed and new softer leaf springs have been mounted. We have increased the hight underneath the car by 6 — 8 centimeters. There have been mounted new friction shock absorbers from a Bentley Blower. The brakes have been checked and the steering has been renovated and enhanced. The Autovac fuel pump has also been renovated and an electrical fuel pump has been installed. We have established two parallel fuel wires, so we can shift between the two pumps by simply turning two taps and activate a switch. The Chassis has been reinforced in both front and back with a strong frame. A7 mm hardened aluminum plate has been mounted to protect the engine and gearbox. We have chosen not to change the original fuel tank of 110 liters, and instead had two 20 liter jerry cans mounted on each side of the car. Should it happen that we will get bad fuel, we can connect the two cans, so the car can keep on driving. Furthermore there has been a fuel filter installed before the pumps, and a water separator before the carburetors. The headlights mirrors have been polished and new sockets have been installed. Beam spotlights have also been mounted. We have manufactured a special funnel for refueling, in which we have integrated a filter including a 10 cm long tube, which works like an overflow, this allows us to see if there is sand, rust or water in the petrol. You can visit Prototyp Museum, Hamburg on 13th — 14th of April on the occation of Long Night of the Museums, where the Bentley 4.5 L, dressed up for Peking to Paris will be exhibited. After returning from Paris, the car, from the 10th of July and till the middle of August will be exhibited at Egeskov Castle, where we will finish of with a presentation and photos from the trip and hand over the donations to the foundations. Данный товар возможно приобрести только под заказ. Если вас интересует данная позиция, напишите, пожалуйста, на [email protected] или оставьте сообщение в форме обратной связи. Bentley Motors Ltd had participated in the 24-hour race at Le Mans since first race held in 1923. This brought added popularity to the Bentley brand name. Development of a model with an engine displacing approximately 4.5 litres began in 1926. The vehicle was named after this engine with which Bentley won overall victory at the 1928 Le Mans. Bentley were able to successfully defended this victory again in 1929. Some 4.5 litre models were modified prior to participating in the 1930 Le Mans race. 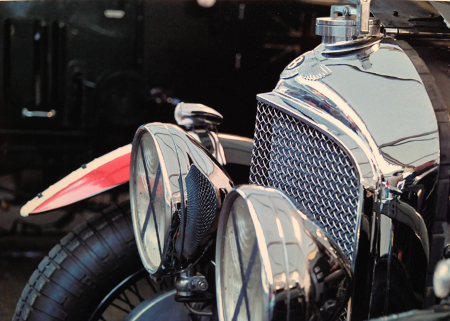 Amongst other items, a Roots supercharger was added and positioned clearly visible in front of the radiator grill, from whence the car then became known as the Bentley 4½ litre Supercharged or Bentley Blower. The power rating of the over 4 metre long vehicle was an impressive 240 hp. Для чего нужен автомобильный конденсатор? Передняя подвеска opel ascona 1989 г.в.